Here are 3 free audio players to automatically download lyrics of currently playing MP3 file. All these audio players are handy to grab lyrics of currently playing song without installing any plugin. Apart from this, these players also show lyrics on their interface. So you can enjoy listening to your favorite song and read lyrics together. Most of these players can also play and fetch lyrics for other audio files, like aac, Flac, Ogg, etc., but make sure that your audio files have correct ID3 tags. Moreover, all players are also able to play video files, but only the audio will be played. Although we already have feature rich audio video players, but none of them provide built-in feature to fetch lyrics for all songs or currently playing song. In that case, these audio players can come in handy. Let’s have a look at these free audio players. ALSong is the best MP3 player in this list to automatically fetch and show lyrics of playing audio file. Unique feature of this player is that lyrics are properly synced with songs. So it will automatically scroll down lyrics and focus on the current line of songs. There are two great features available. One is that it provides separate box for song lyrics which you can detach from its interface. 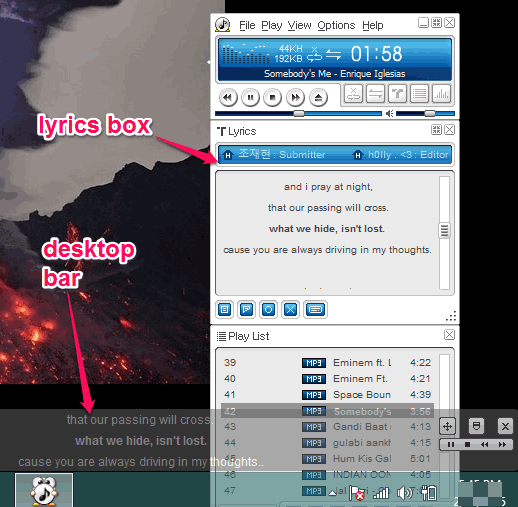 Another feature is that it provides a desktop bar that will show song lyrics at bottom right side of your desktop screen. So even if you have minimized its interface, you can easily see the lyrics, and change the song. There are many other interesting features available that makes it an advanced MP3 player: record audio, play radio, set transparency, equalizer, change the theme, etc. MediaHuman Lyrics Finder is another great audio player in this list. As soon as you add audio files or a whole folder, it automatically starts finding the lyrics of those audio files. Left section of this audio player shows added media files and right section shows the downloaded lyrics of selected audio file. It provides basic controls, but it is handy enough to read lyrics and play songs together. When it fails to download lyrics automatically, you can change artist name and title of a song, and try to manually start the searching. It is around 9 MB in size and supports WMA, aac, FLAC, m4a, mp3, Ogg, and other formats. MeaMod Playme is the last media player in this list to automatically download lyrics of playing audio file. 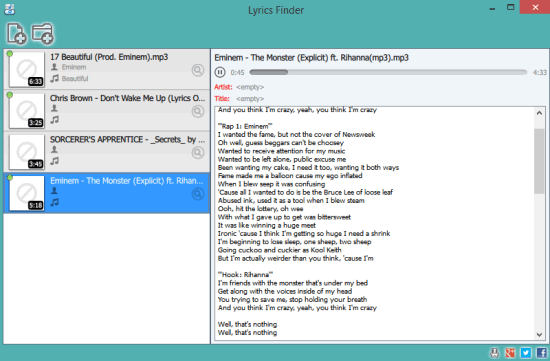 Its Lyrics finder feature is currently in beta phase, so it may not fetch lyrics for some audio files. However, during my testing, it fetched lyrics for many audio files. It provides a separate tab on its interface to view the lyrics and save lyrics to file. Unfortunately, its feature to save lyrics didn’t work for me, but I was able to copy lyrics and save them as a text file. This media player also supports multiple audio and video formats: mp4, Ogg, WMV, WMA, 3gp, DivX, FLAC, MOV, mpg, etc. So it is more than just a basic audio video player. I have added these three players in this list because only these players worked fine during my testing to fetch and show lyrics of playing audio file. Among these three audio players, I will recommend ALSong as this player supports lyrics syncing and provides its handy ‘desktop bar’ to show lyrics.